Ed Dolan's Econ Blog: What Do Trends in Multiple Jobholders Tell Us About the State of the U.S. Labor Market? What Do Trends in Multiple Jobholders Tell Us About the State of the U.S. Labor Market? How many times since the start of the Great Recession have you heard a story like this one, from USA Today? Heather Rolley's primary occupation is motherhood, but it doesn't pay the bills. So most days, after she takes her daughter and two sons to school, the 36-year-old divorcee heads to work. Some days it's at the Polo Ralph Lauren store at an outlet mall, where she makes $8.50 an hour as a part-time sales associate. Other days, she focuses on her home-based Mary Kay beauty products business, making telephone calls, checking orders and meeting clients. Many days, she does both. "It helps me make ends meet, but it's barely enough," Rolley said of her dual income, which is supplemented by child support. "It is very difficult. Holding two part-time jobs, plus being a mom, is a juggling act. It's tough, it really is." Anecdotes like this grab our attention, but just how common are they?After taking a look at the data on part time workers earlier this year, I thought it would be worth digging into the story of multiple jobholders. How many people hold multiple jobs? The first thing we learn is that although multiple jobholders are not rare, they are not as common as the impression you might get from accounts in the media. The following chart shows the basic data. 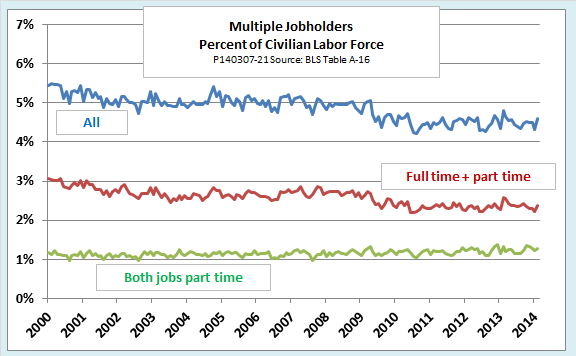 Multiple jobholders account for about 4.5 percent of the labor force. These include 2.4 percent who hold a part time job in addition to a full time job—a pattern we can call FT/PT. Those who piece together two or more part time jobs—Heather Rolley’s category, or PT/PT—make up about 1.2 percent of the labor force. (People like Rolley, whose primary or secondary job is self-employment, count as multiple jobholders, but people whose only work consists of two or more forms of self-employment do not.) Smaller numbers of workers, not shown in the chart, hold two full time jobs or hold multiple jobs that are unclassified because they vary in hours from week to week.